Rajkot : India put themselves in the driver's seat in the first cricket Test through a good all-round display as the West Indies were reeling at 94/6 in their first innings at stumps on the second day in response to a mammoth 649 for nine declared. The second day saw India dominating all the three sessions, making the West Indies' players struggling throughout. In the first session, skipper Virat Kohli brought up his 24th Test century while wicketkeeper Rishabh Pant missed out on one after a blistering 92 as India raced to 506/5. 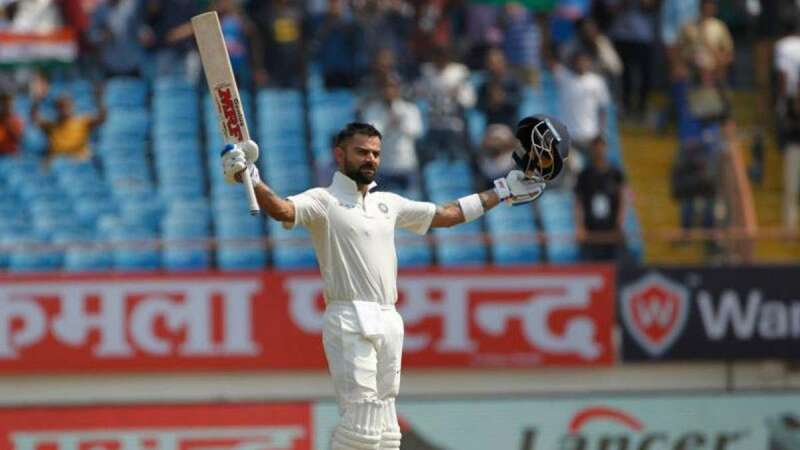 Kohli, who was 72 not out overnight, became the second fastest to get 24 Test hundreds behind only Donald Bradman, who took 66 innings to Kohli's 123. The right-hander took time to get to the milestone as the aggressive Pant (92 off 84), went all guns blazing after resuming at 17. A second Test hundred in his fourth Test was for the taking but Pant tried to hit a six and failed to pick the googly to top-edge the ball for a simple catch to Keemo Paul at backward point. Pant's innings was studded with eight fours and four sixes. He played his usual attacking game from ball one, which he flicked through square leg to get going. Kohli enjoyed his teammate's fluent strokeplay from the other end as Pant raced to his half century with a four and six off pacer Paul. Pant was on 87 when Kohli brought up his ton but the wicket-keeper batsman ended up throwing it away as he went for another six. The second session saw Ravindra Jadeja's unbeaten ton guide India to the imposing total. The hosts declared their first innings at 649/9. Jadeja (100 not out) batted with the tail-enders and completed his brilliant ton which contained five boundaries and as many sixes. This is his first Test hundred. Continuing the second session from 506/5, skipper Virat Kohli (139) was dismissed after adding 19 runs more to his score. He was dismissed by Sherman Lewis. His 230 balls innings was laced with 10 boundaries. Jadeja then played with lower-order batters -- Ravichandran Ashwin (7), Kuldeep Yadav (12), Umesh Yadav (22) and Mohammed Shami (2)-- and completed his first ton in Tests which was highlighted by blitzkrieg hitting towards the end. The West Indian bowlers were thrashed all around the park by the left-hander. For a brief period, Jadeja was joined by Umesh who also slammed two huge sixes. For the West Indies, Devendra Bishoo picked up four wickets while Sherman Lewis chipped in with two wickets. In the final session, India came out to bowl and were right on the money from the first ball. Apart from Chase (27), no other batter stood up to the occasion and went back cheaply. Opener Kraigg Brathwaite (2) was the first one to go in the third over. An over later, Kieran Powell (1) was also dismissed. The duo was packed up by pacer Mohammad Shami. Middle-order batsmen -- Shai Hope (10), Shimron Hetmyer, (10) and Sunil Ambris (12) -- also failed and were dismissed with just 49 runs on the board. With scoreboard reading 49/5, Shane Dowrich (10) tried to spend some time in the middle but after playing 35 balls he was dismissed by chinaman Kuldeep Yadav. For India, Shami took two wickets while Ravichandran Ashwin, Kuldeep Yadav and Ravindra Jadeja took one wicket each. Brief scores: India 1st innings: 649/9 (Virat Kohli 139; Prithvi Shaw 134; Devendra Bishoo 4/217) against West Indies: 94/6 ( Roston Chase 27 not out; Mohammad Shami 2/11) at stumps on Day 2.